How Much Room Do I Need To Store My Room Dividers? 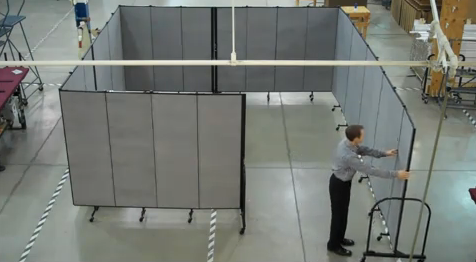 Video Transcript: Hi, this is Steve with Screenflex Room Dividers. This video will help to illustrate the versatility and the ease of setup of our Standard room dividers. A corner is made by simply bending a panel at a hinged point. Making a “T” connection is as simple as butting one divider against another divider. To make a door at a closed space, move the panel on the end or move two panels to make a double door. To store a divider, gather the panels together one by one. They will clasp shut. They can be rolled into the storage area. As you can see the panels alternate turns left, right, left, right, as the divider folds up like an accordion. The latch latches to keep them shut when rolling. 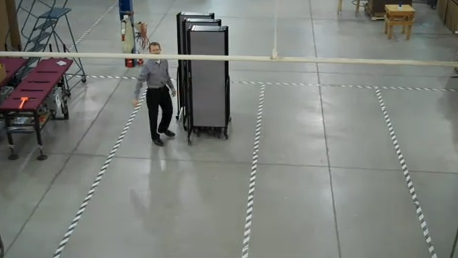 Even the longest divider can be folded into the same approximate 2′ x 3′ storage footprint. Notice that the frame on the ends of the dividers can be nested together so that more than one divider can be stored in a very small storage area. Thank you for watching. Screenflex FREEstanding room dividers nest together easily. See the photos below.